I dug out my sewing machine yesterday. It has been in hibernation for much too long. I decided to make a doll for my daughter. I really should use patterns, but I am more of a freestyle sewer. I am not sure if that is even a thing, but is just what I tend to do when it comes to sewing dolls and stuffed animals. I lack the patience it takes to cut out a pattern, then the fabric. I just go for it, so much more fun that way. I have a horrible time getting the hair on dolls to look right, but thought using roving would work and it did! I literally needle felted it right on her head. 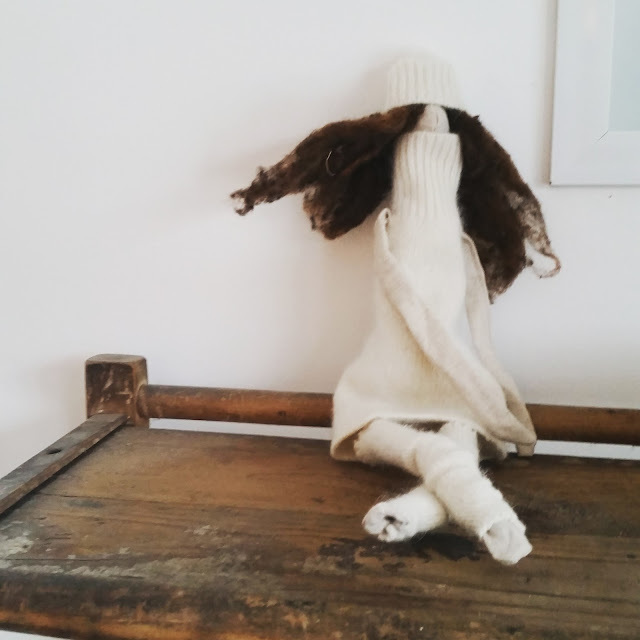 Her clothing is made from felted cashmere sweater scraps. I am planning a quilt next. I cut all my fabric out in August so it is about time! Free-style sewing so totally IS a thing! At least in my mind it is. Thank you for validating my belief that it's okay to work without a pattern, sometimes without a plan. And for showing that the results can be so sweet! There needs to be a free-style sewing movement. And all this time, I thought it was just me, because who's got time to measure when there's wine left in the bottle?? Thank you for putting a name to my sewing style! Growing up my mom taught me to quilt and sew, but every time I actually had a question about fixing a clothing item or something she'd always start by saying what specific needle, foot, thread, etc was needed...my style has always been more about turning the machine on and using black for dark fabrics, white for light things, and just sewing away! That doll is a perfect example of how this method works great! It's a great idea of sharing works. It’s really a great and helpful piece of line.I am glad that you shared this helpful info with us.Please keep us informed like this. Thanks for sharing. I have read the articles you have already presented that are very useful to the reader.